NEED TECHNICAL ASSISTANCE OR ADVICE? 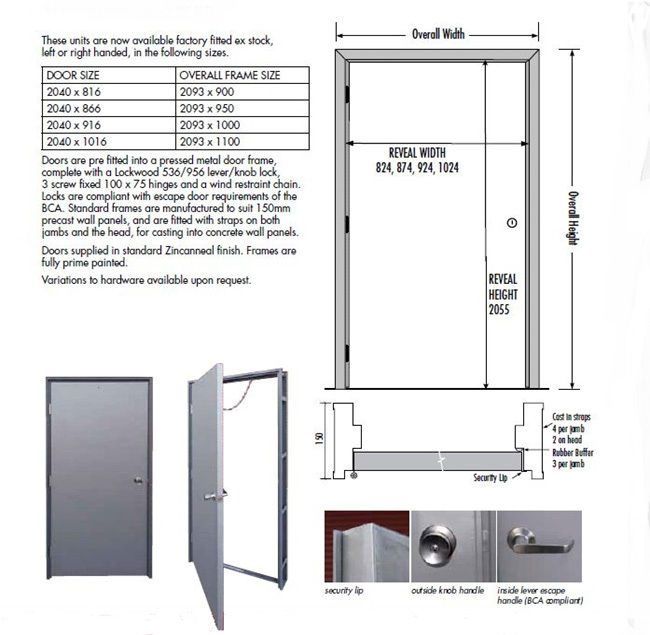 Melbourne Fire Doors manufacture standard factory escape door units. These assemblies are pre fitted in the factory with 3 screw fixed hinges, Lockwood 536/956 escape lock, and a spring loaded wind restraint chain. The frames are manufactured to suit 150mm thick precast concrete panels, and are fitted with strap across the back of the jambs, for casting into concrete wall panels. Frames are supplied fully prime painted. Doors are standard Zincanneal finish, ready for painting. Door frames to suit 180mm concrete walls can be manufactured to order, or any other custom size. Doors can be fitted with Vision Panels or return air grills if necessary.